Experience the magic of Walt Disney World Resort with its four major theme parks, two fun-filled water parks, and an amazing array of attractions, shopping and entertainment for the whole family. Walt Disney World Resort consists of four major theme parks, two fun-filled water parks, and an amazing array of shopping and entertainment. Disney's Magic Kingdom Park, Disney's Hollywood Studios™, Epcot, Disney's Animal Kingdom Theme Park, and two water parks, Blizzard Beach and Typhoon Lagoon. Added to this list is also the beautiful Disney Springs. Located in Lake Buena Vista, Florida, Walt Disney World's 47 breathtaking square miles is the magical setting of Walt Disney World Resort . Also located within the Walt Disney World Resort are lots of exciting attractions, scores of restaurants and shops, two bustling entertainment and nightclub districts, a wilderness area, and two cruise ships. Disney's Magic Kingdom Park is where disney's storybook fantasy comes to life as you journey through seven imaginary lands of adventure and fantasy. Epcot is dedicated to the ageless delight of discovery. An exciting and fun place for the whole family, filled with hightech playthings and countless delights from around the world. Disney's story telling comes to life at Disney's Animal Kingdom. A kingdom overflowing with fun, wonder and adventure. Take a fun-filled safari expedition at Disney's Animal Kingdom, with beautiful landscapes, and exotic animals. Disney's Hollwood Studios celebrates the fascinating world of show business with thrilling attractions, glamorous shows and backstage tours highlighting your favorites from movies, television, theater. Disney's Blizzard Beach presents a winter wonderland of splish-and-splash fun! Themed after a melted ski resort, and built around the melting Mount Gushmore!. This water park also features one of the world's tallest, fastest free-fall speed slides. Disney's Typhoon Lagoon Water Park offers guests twisting tides, thrilling waterslides, roaring rapids and relaxing lazy rivers. This exotic paradise promises to be the wettest water adventure you will ever experience. Walt Disney World Resort is located southwest of Orlando, off Interstate 4, west of the Florida Turnpike. Orlando International Airport (MCO) is located just 16 miles from Walt Disney World Resort. You have the option of taking Disney's Magical Express Bus, which is a free comfortable transportation if you are staying in a Disney Resort Hotel, or a Taxi Cab, bus or shuttle to the park. Here are your options and the cost of each one from the airport. Mears Transporation also offers shared ride shuttle services or exclusive sedan services. How to get around within the Walt Disney World Resort? Getting around Walt Disney World Resort is easy. 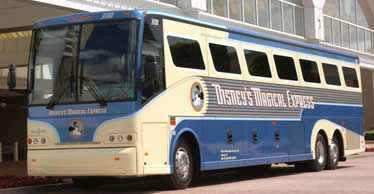 There are many modes of transportation within the Walt Disney World Resort, including Bus, Boat and Monorail. Here is a rundown of transportation within the Disney World resort.